When the rain sensor is activated, it automatically controls the frequency of the wiper intervals, depending on the amount of rain . The sensitivity of the rain sensor can be adjusted manually. Manual wipe . 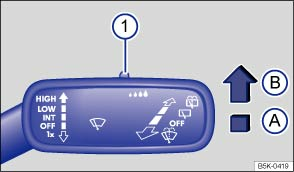 The automatic wipe function can be activated and deactivated using the button and the and Mirror and wipers function buttons in the infotainment system . If the rain sensor deactivated, intervals will be set in levels. Rain sensor is active – automatic wipe when necessary. Switch to the right – high sensitivity. Switch to the left – low sensitivity. 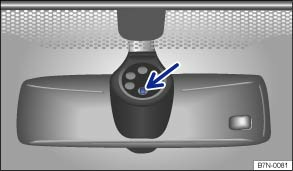 The rain sensor will remain active after the ignition is switched off and back on again and will function again if the windscreen wiper lever is in position Ⓑ and if the vehicle is travelling at speeds higher than 4 km/h (2 mph). Damaged wiper blades: a film of water or smears caused by damaged wiper blades can increase the time the wipers are switched on, can shorten the length of the intervals between wipes or cause the wipers to run continuously. Insects: insects hitting the windscreen surface can cause the wipers to be activated. Salt deposits: in winter, salt deposits can cause the wiper to continue to wipe the windscreen when it is almost dry. Soiling: dry dust, wax, windscreen coatings (lotus effect) or detergent deposits (automatic car wash) can cause the rain sensor to become less sensitive and react too slowly or even not at all. Crack in the windscreen: when the windscreen is impacted by a stone, a wash cycle is triggered if the rain sensor is on. The rain sensor will then register the reduction in sensitivity of the surface and adjust accordingly. The size of the crack could affect the way in which the sensor activates the wipers. The rain sensor will not always detect every rain shower and activate the windscreen wipers. If necessary, switch on the windscreen wiper manually if the water on the windscreen restricts the field of vision. Clean the sensitive surface of the rain sensor (arrow) at regular intervals and check the wiper blades for damage. We recommend that you use an alcohol-based glass cleaner to remove wax and polish.